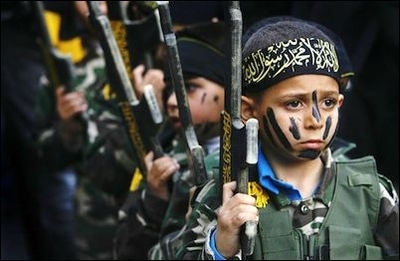 Hamas, to be sure, proposes to die in an accelerated time frame and a particularly disgusting fashion, but it should be kept in mind that self-willed extinction is the norm. West of the Indus, Israel is the only survivor among the thousands of little nations that flourished between 10,000 BC and 600 AD. To be sure, there have been plenty of small tribes that wanted to live but were trampled by conquering hordes. The rule, however, is that civilizations die of their own disgust with life. Most of the industrial nations are dying, some very quickly. Most of the Muslim world would rather die than accommodate modernity (although some of it may choose to cease to be Islamic). I do not mean to sound cruel, but the best thing you can do for victims of a dying culture is: Don't be one of them. Individuals who want to live have the option of changing cultures. I do not mean that Israel (or anyone else) should go about killing off enemies in order to satisfy their death wish. God forbid: life is still sacred to us even if it is repugnant to them. Neither do we have to commit suicide in order to accommodate our crazy neighbor's death-wish. We might try to talk him down from the roof, but we are entitled to step aside when he jumps. It is not in our power to persuade suicidal civilizations to carry on living. Ultimately it is our job to contain the damage to ourselves. We cannot help but accept some civilian deaths while engaging an enemy that seeks the maximum number of civilian casualties. All of this is anathema to liberals, whose premise is that human agency can fix all problems. Enlightenment materialism posited a natural man who either sought self-preservation (Hobbes) or naturally pursued his own best interests (Locke) or was inherently good before corrupted by civilization (Rousseau). Satanic laughter from around the Levant drowns out the squeaky, thin voices of the Enlightenment. One no longer needs to read about it in books. The Middle East has become "How Civilizations Die: The Reality Show." Israel is the only developed nation (with a fertility rate of three) that loves life sufficiently to bring more children into the world than are required to replace the existing population. Even the US has fallen below replacement as Hispanics assimilate into Western culture and younger evangelicals behave more like their secular peers. Israel today, as at the time of the prophets, remains a unique and irreplaceable light unto the world, the paragon of a nation, the hope of all humanity. Today it is the proof that modern men and women can embrace life and raise themselves above the tragic fate of the peoples since the dawn of man. Anti-semitism is the vicious grudge that death harbors against life. We are tired of refuting the clumsy calumnies that are thrown at Israel each day in the liberal media. Our response is in the imperative: "Choose life!"